It is a little-known fact that Tetris was not originally intended to be bundled with the Game Boy. Henk Rogers, a game developer and founder of “Bullet-Proof Software”, convinced Nintendo of America president Minoru Arakawa that Tetris, and not Super Mario Land, would give the Game Boy broad appeal across multiple age groups. Mr. Rogers was eventually able to secure the rights to Tetris from the Soviet ministry of software and hardware export (ELORG), and the rest is history. As of this writing, the Game Boy version of Tetris is the third-best selling game of all time, having sold 35 million copies worldwide, behind only Super Mario Bros. (40 million) and Wii Sports (50 million). 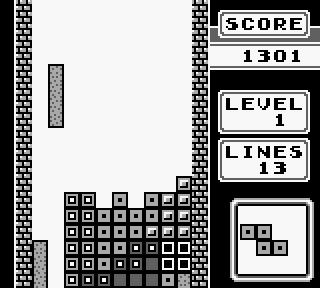 Like the NES release, Tetris for the Game Boy features 2 game modes; a normal marathon mode (A-Type) in which you complete as many lines as possible, and a second mode (B-Type) in which you must complete 25 lines before your stack reaches the top of the screen. In B-Type, you can choose from 6 difficulty levels which determines how full of randomly-placed pieces the stack will initially be. The primary improvement that this game has over the NES version is the ability to play a 2-player game head-to-head via the Game Boy link cable. Each player is competing for high score, but a twist is added in that each multi-line completion performed by a player causes an incomplete line to form at the bottom of their opponent’s stack, moving it closer to the top. Graphically, the game looks very good despite being in black and white, with varying shades of grey and unique patterns used to give each piece (tetronimo) a unique look. The Russian flair prevalent in the Tengen NES release and scaled back drastically in the Nintendo NES release is completely absent in this version, but the music selection is clearly the best of the three games. Included is the Russian folk song “Korobeiniki” which has become the song most closely associated with Tetris, along with another old Russian wartime song called “Katyusha”. The third song is a lesser known work by Bach which, while not of Russian origin, fits in nicely with the other two songs. While I consider Tengen’s release of Tetris on the NES to be the definitive version of the game, there is no denying both the excellence and the importance of this release. Buy Tetris on GameGavel or Amazon. Tagged 1989, Bullet Proof, Game Boy, Gameboy, launch, Nintendo, Puzzle, Review, Tetris. Bookmark the permalink.